One local cell phone dealer and repair business is aiming to provide cellular service with a personal touch to LaRue Countians. Hometown Wireless is a Bluegrass Cellular and H2O Wireless dealer that offers a wide selection of new and used phones, phone accessories and phone repair. Pictured are managers Mike and Tammy Fisher. Hometown Wireless is located on 74 Shawnee Drive in Hodgenville. Their hours are Mondays through Fridays from 9 a.m. to 5:30 p.m. and Saturdays from 9 a.m. to 3 p.m. The Bluegrass Cellular and H2O Wireless dealer offers a wide selection of new and used phones, phone accessories and phone repair. 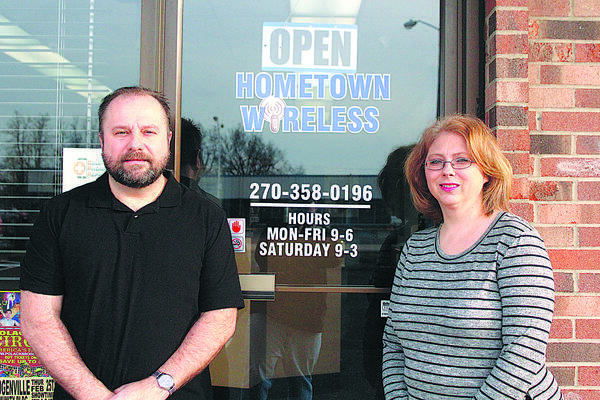 Hometown Wireless is owned by James “Jim” Ferrie and the business also has locations in Campbellsville and Elizabethtown. The Hodgenville location was opened in August 2011 and it’s managed by Mike and Tammy Fisher. Mike Fisher said he and his wife Tammy both worked at a local construction company when the economy took its toll on the industry. Tammy Fisher said the thing they like the most about their jobs is they both like helping their customers locally so they don’t have to go outside of the county to find cell phone service. For more information about Hometown Wireless call 270-358-0196 or visit www.myhometownwireless.com.